Are you looking for a detailed listing of Art & Craft Shows, Fairs & Festivals in Delaware? 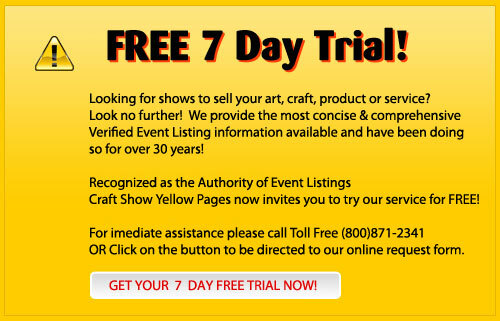 For HUNDREDS more great event listings, subscribe to our online craft show guide, Art & Craft Show Yellow Pages. Keep current and see events approaching application deadlines! Harrington, DE: Dover Officers' Spouse's Club Craft Show at the Delaware State Fairgrounds. Outdoors, under roof, Adm. $5, 9:00-4:00, 150 spaces, arts, crafts, food, security, Elec. $25. Juried by photos of merchandise and workshop, copy of receipts for raw materials. 10x10-20, $140-$320, jury fee $15, 24 yrs, 3,500 last yr.
You may be interested in tips and articles on effective display techniques, questions to ask about merchant credit , and other information we post on our website to help you become more professional. 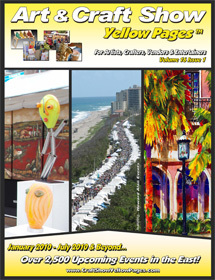 These articles were previously published in Art & Craft Show Yellow Pages. Bookmark this site, and return again, or see our event listings in other states.